Although their name seems to indicate otherwise, black rhinoceroses (Diceros bicornis) are technically more of a dark grayish color. These massive two-horned animals originate in Africa, where they tend to frequent very remote environments. The population of black rhinoceroses is quickly decreasing due to a variety of different factors, hunting being one of them. Black rhinos live in areas of central, southern and eastern Africa, particularly in Zimbabwe, Angola, Malawi, Namibia, Zambia, Botswana, Kenya, Swaziland and South Africa. 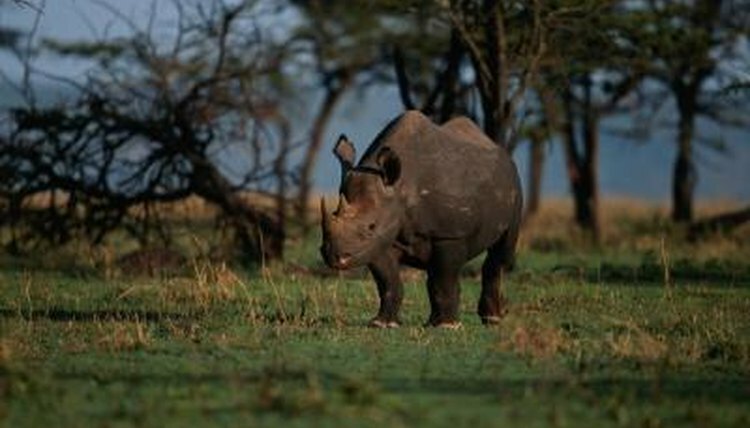 In the past, the rhinos were prevalent in most of Africa south of the Sahara desert. They no longer exist in Rwanda, Chad or Cameroon. Black rhinoceroses live in a wide array of different types of settings, including acacia savannas, deserts, scrublands, woodlands, damp forests, montane forests, grasslands, rocky hills, plains with ample bushes and grasses and thick brush. These rhinos also often live in semi-arid places. In general, they remain no further than 15 miles away from bodies of water. It is not uncommon to spot black rhinos turning over in mud, which is a way for them to cool their bodies down in times of excessive heat. Black rhinos are in the category of critically endangered animals, indicates the IUCN Red List of Endangered Species as of the year 2012. One of the main reasons for the drop in population is poaching, as their horns are sought after by some for both decorative and medicinal uses. Habitat destruction is another factor that also may contribute to the endangerment of the animals -- particularly due to the clearing out of bushes for firewood and farming purposes. When a black rhinoceros has a loose home base in a specific habitat, he may roam distances as minimal as less than 2 miles, to those as vast as over 82 miles, indicates Animal Diversity Web of the University of Michigan. The more optimal and comfortable the living conditions of the base habitat are, the less likely the black rhino probably will go longer distances. If a black rhino is capable of easily finding sustenance in his habitat, he probably won't stray very far.